There is a year from "Light Court", the 3rd album of Firo is more elegant , soft touch, natural and rich sound. 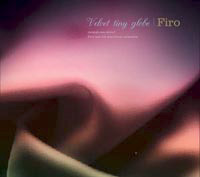 Firo says----"My music is like a tiny globe." He had created precise and beautiful tiny globes like sophisticated hard steel, and his next, new "globes" is more soft touch,----- like a Velvet. firo03.jpgIncluding guitar and vocal sample of himself,Firo performs his rich and hi-fi sound in this wonderful new album.Not only electronica,this new album "Velvet tiny globe" has also rich flavors of Jazz,rock,even soul music. Firo - touch - 06:16 � 00.00 Buy this Song ! Firo - Broun Orchid - 08:01 � 00.00 Buy this Song ! Firo - Sea amber - 04:55 � 00.00 Buy this Song ! Firo - Beyond the waterfall - 07:53 � 00.00 Buy this Song ! Firo - write on papyrus - 06:24 � 00.00 Buy this Song ! Firo - tell me what you see - 03:40 � 00.00 Buy this Song ! Firo - marmalade groove - 07:08 � 00.00 Buy this Song ! Firo - Fruits of thought - 06:24 � 00.00 Buy this Song !